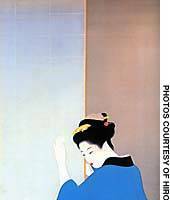 Shoen Uemura was a rarity — one of the few Japanese female artists who worked in a traditional style and found recognition and acclaim. “The Shoen Uemura Retrospective,” an exhibition showing at the Hiroshima Prefectural Art Museum (then moving to the Utsunomiya Museum in Tochigi Prefecture later this month), brings together a comprehensive body of works loaned by more than 40 museums, galleries and private collections across Japan. It provides a welcome look at an unusual artist. Uemura was born in 1875 into a comfortable, middle-class Kyoto family. Her father died before she was born, leaving both Uemura and the family tea shop in her mother’s care. As a girl, Uemura filled her hours by drawing, and she soon gained a reputation as a prodigy among the shop’s customers. At age 12, Uemura began her formal art training and made such fast progress that her first show was held just three years later. Soon, she was winning awards in official art contests, which brought her to the attention of the art establishment and private patrons who began to commission work from her. Despite the occasional jealous comments by male art acquaintances, Uemura’s rise seems not to have been hindered by prejudice. Indeed, she was well-respected from the precocious beginning of her long career to the very end, becoming the first woman to be awarded the Order of Culture, in 1948. She died of cancer the following year. The vast majority of Uemura’s works depict attractive, kimono-clad female subjects, and at first glance recall the genre of the ukiyo-e woodblock prints known as bijin-ga (pictures of beautiful women). The Edo Period bijin, however, were mainly courtesans from the pleasure districts. Working in a different period and in a different milieu, Uemura is not considered a proponent of the traditional bijin-ga style. Uemura first sketched her compositions on large paper sheets called shita-zu. These, placed under the paper to be painted, allowed the outlines to be easily copied. The paintings were executed in iwaenogu (mineral pigments). One of the advantages of this method was that it allowed the artist to easily execute variations on earlier compositions, as shown by two paintings displayed here that are based on the same shita-zu, a scene in which a group of courtesans are enjoying hanami (cherry blossom viewing). The two versions — one made in 1907, the other in 1910 — are identical in outline but show differences in coloring, and some freedom in the outlines of certain features such as the parasol and kimono. More suggestive, however, are the differences between the depictions of the women’s faces. The ladies of 1907 have chiseled eyes and pursed lips, closely resembling the Edo bijin-ga; the same faces in the 1910 version, however, seem to express more emotion, their eyes are rounder and more open, as are their mouths. It’s difficult to know what to attribute these changes to — is it, perhaps, the influence of Western painting, or is it merely personal whim? At the beginning of her career, certainly, Uemura was open to artistic experimentation. In “Beautiful Women in Snow” (1911), for example, two young ladies are hit by a strong gust of wind, and Uemura captures the flowing shape of the wind-swept garments with highly expressive outlines in ink. Such bold displays of movement are rare in bijin-ga — and also in Uemura’s work generally. Following the chronologically arranged rooms of the exhibition, one can see how such early experimentation gives way to a more formal refinement in the traditional Japanese style. This can produce some delightful effects. 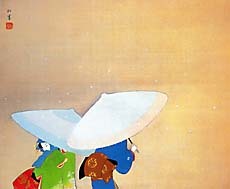 In “Spring Snow” (1944), Uemura positions the figures of two women, partially hidden by their parasols, in the bottom left of the frame and leaves the rest of it empty (apart for the occasional snowflake) to suggest depth — a typical Japanese construction. 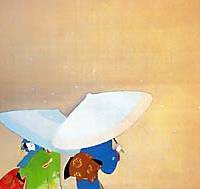 The parasols are rendered as broad, flat shapes in muted hues so as not to distract from the vivid coloring of the kimono. Among the paintings Uemura produced toward the end of her life are depictions of her childhood memories of her mother. In one graceful piece from 1943, for example, her mother is fixing the paper on the shoji; in another she threads a needle by the light of the fading evening sky. These are more domestic than the typical bijin-ga, but perhaps represent the culmination of Uemura’s own style: quintessentially Japanese and delicately personal.